overlooking Hyde Park, a stroll away from Harrods, Sloane Street, and Knightsbridge. The building served as a St George’s Hospital, though you wouldn’t know it: although the façade remains the same, the interiors were redesigned by Alberto Pinto to imbue the place with a Regency era-feel: think high-ceilinged rooms in distinctively English colors and patterns – soft, warm greens, pinks, yellows, and blues, adorned with whimsical prints– with Baroque-style cornicing, decadent chandeliers, and 23-carat gold-leaf gilding. The Michelin-starred Céleste restaurant is, of course, unmissable. 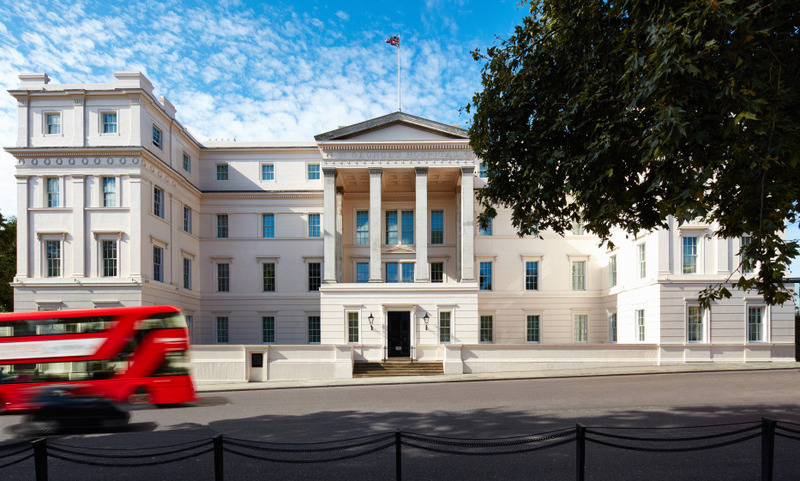 Do not miss the newly opened Lanesborough Club & Spa, home to internationally recognised experts in the fields of fitness, beauty and wellness. Have a dinner at Céleste, The Lanesborough’s Michelin starred restaurant, run by Chef Patron Eric Frechon. Within the comfort of your bedroom, your butler will be on hand around the clock with complete discretion. An extremely elegant and gracious hotel with excellent staff. Really lovely hotel. You feel like you're in an English Manor. Service was truly magnificent. This was our first stay at the Lanesborough as we usually stay at the Dorchester but the Lanesborough is in a class of its own. The attention to detail in every area of the hotel is first class. The room was perfect and the staff could not have been more friendlier and professional. Wonderful hotel. Friendly and efficient staff. Very nice and spacious common areas. Refined decoration throughout the hotel, especially in the dining room. Pleasant, well-equipped rooms and quality bedding. A very luxurious hotel with a very British atmosphere. Very well located and intimate. It is a great hotel, very well located between Mayfair and Knightsbridge. The staff is very professional and the decoration splendid. Perhaps the bathroom could be a bit larger, but the amenities and the lighting were superb. I think it will be definitely our hotel in London. It is the most wonderful and amazing hotel and for sure wouldn't hesitate to stay there again. I totally enjoyed my stay and was satisfied on all levels.